Even though the clothes get top billing on the runways, accessories have their pride of place in the limelight too. And what could be better than two beloved brands mixing it up for fashion's sake? Almost nothing when the brands turn out to be Comme des Garcons and Melissa. Say what? That's right sole-sisters! Let me put it this way; if Comme des Garcons and Melissa had a baby, she would be this perfectly formed, mumsy plastic pump. A rubbery black nun shoe that means serious (fashion) business. Never one to discount the importance of what you put on your feet, Rei Kawakubo knows a thing or two about subverting the idea of what a shoe should be. Over the years, she's turned them inside out, added inches to their length and girth, topped them with graffiti shoe covers and fluffed them up with cotton candy pink faux fur. Don't ever expect that she'll give you nothing less than the weird and the wonderful for your footsies, which is why collaborating with Melissa is nothing short of genius. 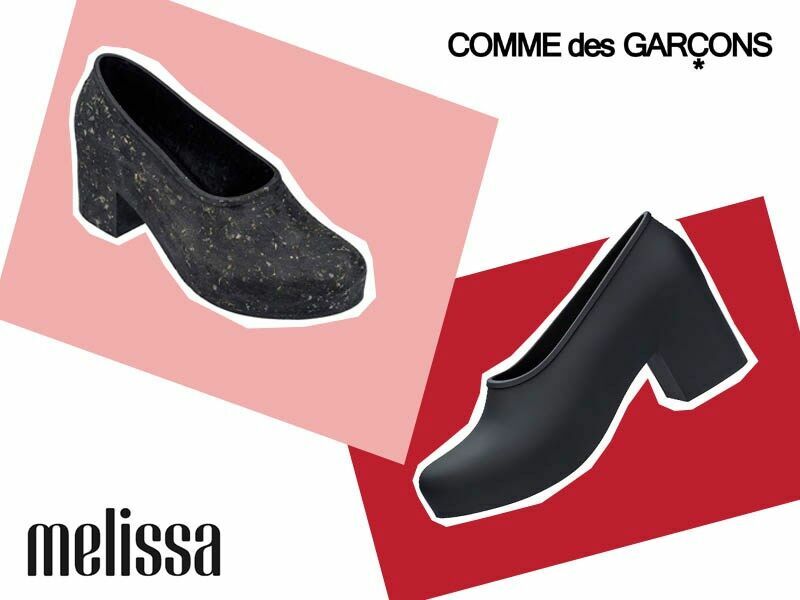 Season after season, Melissa has approached footwear with a quirky, modern esthetic wrapped up in their soft, wearable proprietary plastic shoes perfumed with a signature scent that's one part girlie and one part futuristic funk. The Comme x Melissa pump is the ideal iteration. Black, fugly and as un-summery as you can get for a summer shoe. But, that my friends is the Rei way. If you're a purist, then the solid black number will be right up your alley. It's simple, understated and the perfect punctuation, a pump with purpose. "The surprising thing is that it's a shoe with no sole, and no top as if it were a single thing. It's a single block, which is exactly what you'd expect from Comme des Garcons," comments Racquel Metz Scherer, Marketing Director of Melissa. But what about those moments when you're feeling a bit more whimsical? Then turn to Kawakubo's preferred polka-dot. In the lexicon of CDG, polka-dots reign supreme and jubilantly appear in every collection, as a proverbial jolt of sunshine to the rigor of black washed poly and structured silhouettes. Not the Plain-Jane or prissy type, but perhaps you're more of a dirty girl? Fear, not because Kawakubo & Melissa have cooked up something special just for you. Embedded into the surface of the shoe are bits of fashion detritus for that 'I don't care if my shoes are messed up' look. But clearly, if you're flaunting these babies, you care lots. And then there's the shoe that spells it out loud and proud. Can you hear me now? Made exclusively for the diehards among us, this cool, collectible shoe is a 'feet' of fashion. A graffiti, punked-out namesake pump that will have us wondering with card in hand if we need one to wear and one to display on an altar to the high art of Comme. Available at Comme des Garcons & Dover Street Market, worldwide.